1) psychrometer - measures the temperature difference between a wet-bulb and a dry-bulb thermometer. A sling psychrometer is mounted in a frame, then whirled in the air for ventilation. 2) hair hygrometer - measures the expansion and contraction of a human hair that is mounted under tension. 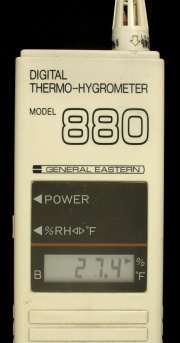 A gold beater's skin hygrometer uses a proteinaceous membrane for the same type of measurement. 3) dew-point hygrometer - measures the temperature for the formation and evaporation of dew that is observed using a photoelectric cell. 4) diffusion hygrometer - measures the diffusion of water vapor through a porous membrane. 5) lithium chloride hygrometer - measures the temperature and electrical conductivity of a hygroscopic salt that becomes conductive when it absorbs water. This page was last edited on 1 May 2016, at 06:30.